It's official, I have gone bling crazy and I have a serious medal problem. While at the Rock n Roll St. Pete Half Marathon Expo, I was able to get a sneak peak of the 8th annual First Watch Sarasota Half Marathon & Relay medal. I instantly fell in love with this huge dolphin medal. 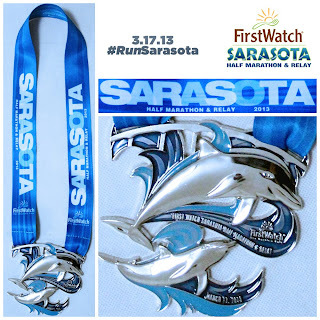 Seriously, HOW cute is the 8th annual First Watch Sarasota Half Marathon & Relay medal?! What makes this race even better is that it is sponsored by FirstWatch, one of my absolute favorite breakfast restaurants. 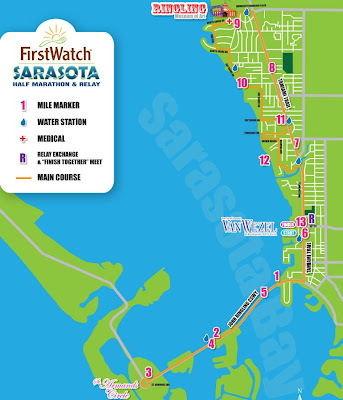 The 8th annual First Watch Sarasota Half Marathon & Relay also has a great course, running over the causeway, through St. Armands Circle and passing through Ringling Brothers Museum of Art. All I ask is to keep the clowns away from me! Here's the great news, I have a discount code for the 8th annual First Watch Sarasota Half Marathon & Relay medal. Click here to register. I know a lot of my Tampa blogger friends are already trained for this event as we've been doing so many half marathons over the past few months. I cant even grasp that this will be my 5th half within a three month period of time! Come join us and add the beautiful medal to your collection. ughhhhhhh Megan! Everytime I see this medal I want to sign up! I haven't registered for my 10k and I keep going back and forth on this... I just know I wouldn't be able to do a Pr on 4 hours of sleep :( Perhaps next year though. The race can only get bigger and better as the years go by right? Awe! I was hoping you would be there. Four hours of sleep isn't good to run on. You could run for fun and not speed though - I know a few people doing that! That medal is awesome & the race sounds so fun!!! Thanks for the coupon code. I just used it to register. That is wonderful to hear! Hope to see you there.